This is the first of several informational posts about this RP and the naval status at the time. I am no accepting character sheets at this time, so do not send them. This RP, like SoNY is meant to be literate, but unlike SoNY this will be enforced. I am also going to limit the number of people in the RP so we get one coherent storyline instead of three or four differing ones. Now in the RP there will be many different sides. The Royal Navy, which I will be apart of, is one of the nations that were represented during the time of play. (which, because I have not stated this before, is going to be 1790). Other nations include France, under the French Navy; Spain, under the Spanish Navy; and The Dutch, under the Dutch Navy. Then there are privateers, which are different from pirates. A privateer is basically a pirate ship working for a county, like Great Brittan, to destroy the shipping of a country they are at war with like France. Lastly there are pirates. This bloodthirsty band will be the primary area for women who with the RP as there own gender. A pirate is free to attack anything it chooses but can also be attacked by anybody and everybody. There is no safety net for these men(or women). Now my feeling is that each player should be a captain, to avoid god modding and the like. But, If a player is willing to be a subordinate I would be fine allowing two players on the same ship. Now I would like to point out a few things here. In all ships the decks that have cannons on them (aka a gun deck), the walls such as the walls that block off the captains cabin would be removed when the crew was called to quarters (aka battle stations). Also, you will note that there is a place called the gun room. This is where they keep guns. However, it is also the place where the ships midshipman(normally 7-18 year old boys) would eat and sleep. The wardroom is where the ships officers would sleep with the exception of the captain who had his own quarters. One last thing for this post. you see how the deck with the ships wheel on it has walls. Those would normally be what they would call a railing, and not a full wall. but I'm sure you knew that already(the diagram was kinda bad). Twice-monthly Celtic and Irish music by the best independent Celtic music groups. Irish drinking songs, Scottish folk songs, bagpipes, music from Ireland, Scotland, Brittany, Wales, Nova Scotia, Galacia, Australia and the United States. Hosted by Marc Gunn of the Brobdingnagian Bards. Right, today I think I will talk about ships. Well, before I begin I would like to say that this RP is changing history a little bit. technically speaking the age of pirates died out by 1720 but we are going to let it continue for the purpose of this RP because between 1790 and 1815 we see to peak of sailing tech. Anyway, about the ships in this RP. I think it would be best when you submit a character sheet to tell me about what type of ship you want, and I will come up with an exact one for you. So lets get you all acquainted with the different ships for starters. On a side note, the number in the name(like 74) refers to the number of guns this ship carries. This is how we classify ships in the navy. The 74 had two gun decks and a full compliment of gun in the forecastle and quarterdeck as well. The lower gun deck would carry 32 pound cannons, which were the largest type of cannon a ship would have carried at that time(note that the number of pounds a gun is called by is how much the cannon ball weighs. Like the number of guns on a ship classifying the ship, the weight of the shot in pounds dictated the type of gun). The upper gun deck would carry 18 or 12 pound cannons. 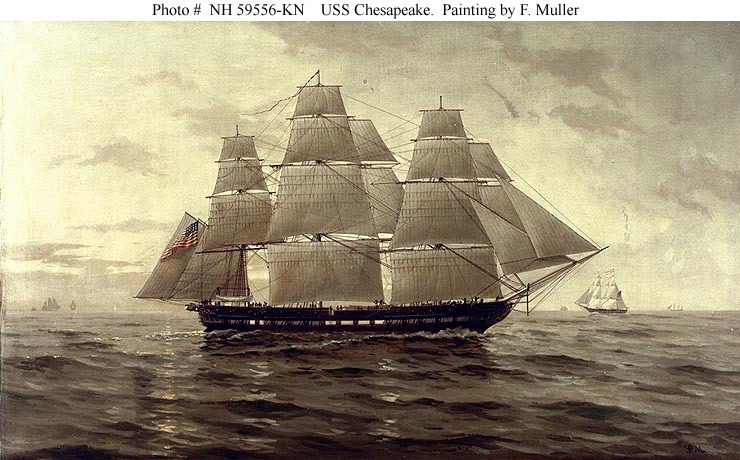 And the Forecastle and Quarterdeck would carry 9 or 6 pounders. None of us will have a 74 because they are large and only used by the navies of countries. It would not be fair to the pirates and such if we allowed them. The 44 was normally an American ship and as such only America will have 44 gun ships. They had four during this period of time. The 44 had one gun deck which had a full armaments of 18 pound cannons. The Forecastle and the Quarter deck would be armed with either 12 or 9 pounders to make up the full 44 guns. The 44 is the largest playable ship in this RP and is also the largest frigate, which is a ship with guns ranging from 44-28 guns. All frigates are post ships, meaning that a captain of the post rank (AKA a Post Captain) would be in command(I will post ranks later). The 38 is the most common frigate at this point in time, it is almost exactly the same as a 44 except that is is shorter, allowing for fewer guns. Some of the old 38 gun frigates also had 12 pound cannons on the gun deck instead of 18 pounders. Both of these ships were simply shorter in length then the 38 and had weaker armaments. The 36 used 12 pound cannons on its gun deck and the 28 used 9 pounders. A sloop is the smallest vessel to have 3 masts, anything below it is a brig. A sloop has between 18 and 26 guns all of which are 9 pounders with the exception of the large sloops, which would have 6 pounders on the quarter deck. A sloop normally does not have a forecastle. 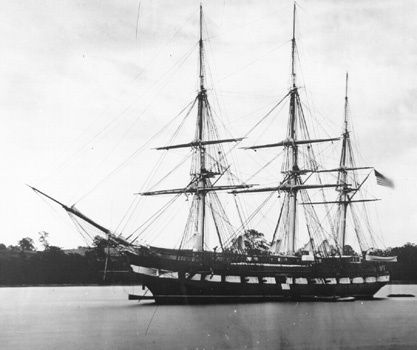 A brig has only two masts and only a few guns. They are pretty useless unless you want to go up a river or got between two ports without battle. They are easily out gunned to anything higher then themselves. I don't intend to issue any brigs unless requested.